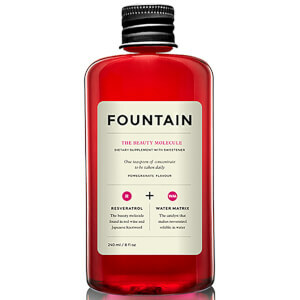 Discover the range of liquid beauty supplements from Fountain here at Mankind. 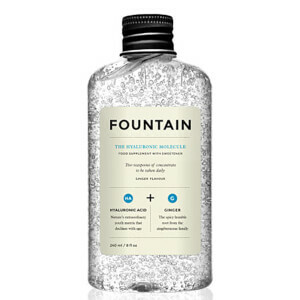 Created by Deciem, Fountain are an innovative brand offering a range of high-performing liquid supplements. Their range of look good molecules are concentrated with each supplement designed to specifically target a certain area. Each supplement boasts a unique, delicious flavour and real results so you can improve your appearance from the inside out. To use the Fountain supplements, mix one teaspoon (5ml) with your favourite juice or beverage. Drink as many as you like, but don’t exceed 5 teaspoons per day. Remember to shake the bottle lightly before consumption. 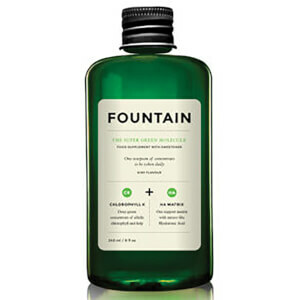 The Fountain The Super Green Molecule is a liquid supplement designed to improve the red blood cell count and oxygen levels within the bloodstream. Containing over 40 minerals, 16 amino acids and 11 vitamins, it regulates and preserves moisture whilst improving overall health and well-being. Ingredients alfalfa chlorophyll and Hyaluronic Acid aid detoxification and boost internal tissue hydration for cellular repair, aiding weight management. This delicious kiwi flavoured supplement is suitable for both adult men and women. The Fountain The Energy Molecule is an orange flavoured drinkable supplement made to dramatically boost energy levels. Combining creatine, ginseng, coffee bean extract, vitamin B12 and Hyaluronic Acid, it improves concentration to help you to stay focused. Cognitive functions are improved, the central nervous system is supported and it helps to balance a normal, energy-yielding metabolism for sustainable, lasting energy.